Irish Rail’s Sperry rail inspection train at Islandbridge Junction, Dublin August 30, 2012. Camera: Canon 7D fitted with an EF 28-135mm zoom. Every so often everything comes together nicely. Yesterday (August 29, 2012), I learned that Irish Rail would be running its Sperry inspection train up to Dublin for stabling at the sidings near Heuston Station. This suits me well, as I’m staying just a short walk from Islandbridge Junction, immediately west of Heuston. While I caught the train yesterday afternoon, the conditions were less than ideal, although typically Irish; it was heavily clouded and lashing rain. I racked up the ISO to 800 on my Canon 7D digital camera and popped off a few frames, which I was happy to get. In 14 years of photographing Irish railways it was the first time I caught the Sperry train on camera. What’s a ‘Sperry train?’ In the early part of the 20th century, a hidden rail fracture caused a serious derailment on the Lehigh Valley Railroad in New York. This tragic incident inspired prolific inventor Elmer Sperry to devise a system of inspecting rails. This consisted of a magnetic induction profile. For many years self-propelled black and yellow ‘Sperry Cars’ have been seen making the rounds on American railways. In more recent years, Sperry Rail devised a testing system using ultrasonic equipment to reveal rail fractures. Today, Sperry provides rail-defect detection services in many countries. On today’s train, Sperry’s detection equipment is in the yellow container riding on a flat wagon immediately behind the locomotive. The yellow tank wagons are to assist with braking. A perfect sunny day greeted me this morning. I’d heard the train was due to depart the old Guinness sidings at Heuston about 9 am, so I was in place at that time. For this exercise I used my Canon 7D fitted with a EF 28-135mm lens. This arrangement gives me great flexibility, produces high quality images, and allows me to post images very quickly after exposing them. Another benefit is the digital medium allows me to make test frames that I can analyze on site to check for proper exposure, adequate focus, as well as framing and etc. For this image, the famed Wellington Testimonial (located at the east end of Dublin’s Phoenix Park) is featured. I’ve made many photos here before, but sometimes with film I’ve inadvertently cropped the top of monument while focusing on a moving train. I tried to avoid this mistake today, and with digital I could check right away, and not wait days or weeks to find out. With the camera set manually (in ‘M’ mode) I made several exposures bracketing my crop and exposure. This one was made at f6.3 1/500th of second at ISO 200; lens set to about 35mm. I made two files in camera; a large Jpg and a RAW. I made no adjustments to this image, other than scaling the large Jpg to 1024 pixels on the long side and adding my name and copyright information. I feel I’ve had a productive morning so far! Later, I also caught one of Irish Rail’s IWT Liners, an intermodal container train that runs from Dublin Port to Ballina, County Mayo. Today, this was led by one of Irish Rail’s 201-class General Motors diesels wearing the Enterprise livery. While not unheard of, it is a good catch to see one these in freight service. Interested in learning more about Dublin? Check out my ePub for iPad: Dublin Unconquered, now available on iTunes for just 4.99. I’ve described myself as a ‘progressive obsoletist,’—an unfamiliar term that I may have invented. Invariably, someone will try to pigeon-hole me, demanding, “what is that? !”—as if the term wasn’t completely self-explanatory. Without a long-winded, half-cynical satirical diatribe, I doubt I could convey my definition of this obscure set of beliefs, however, in photographic terms I’ll offer a contemporary corollary based on recent experiments. I’ve been dabbling with black & white photography for decades. I nearly perfected my technique when I was in college, only to virtually abandon black & white professionally in favor of color media. However, from time to time, I return to black & white, and with each visit try to further hone my process. What does that mean? Well, first off, I always process my own film. Secondly, I’m very conscious of the processing method and formulas I hope to use while I’m making photographs. Thirdly, I’m always making small adjustments in my process in efforts to making more pleasing images. The caveats to this process adjustment are that: 1) I’m never really satisfied with my results; 2) I never will be; and, 3) despite constant tinkering with formulas, my actual process is based on empirical analysis, rather than a strict, calculated scientific approach. I’m sure photo-chemists, when analyzing what I do, would decide that about half my process is unnecessary, and while on the whole it’s too complicated and could be better achieved in some alternative manner. But for me that’s not really the point. Making and developing the images are all part of the process, and this process involves converting what I see in three dimensions and full living color into a static, two dimensional, mono-chromatic set of images. 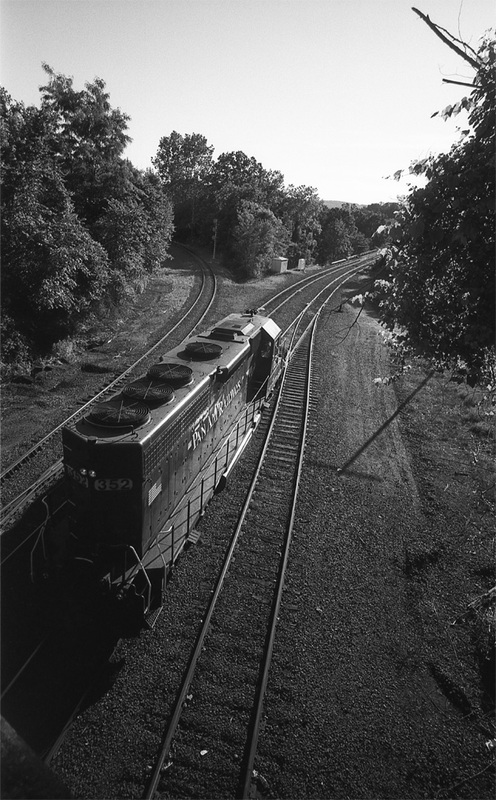 In January, 1998, TRAINS Magazine, I had a portfolio of photos published, and in that series, I described the spread with three monochromatic images as ‘One Thousand Shades of Gray’. Well, in light of some recent popular literature (not involving monochromatic images, so I am told), a similar title with fewer numbers of shades has stolen my thunder. Fair enough, but not really my point. With One Thousand Shades of Gray I was only trying to be clever, since proper black & white photography is more than just black and white but more about all the gray in between. And that’s largely what I’m after in my process refinement and adjustment — tonality and contrast. The machinery and landscape of the railroad are subjects ideally suited to this medium, while slight adjustments can make the difference between a fairly interesting railroad image and a truly memorable one. So, why use film? The short answer is pretty selfish; because I want to! I like B&W photography, I like film, I’ve always worked with film, and continuing to work with film (at least part of the time) lends a certain continuity to my photography. I have other reasons as well. I’ve found that using film, processed in accordance with my customized formula, and then scanned with a flatbed scanner, produces an image file that looks really pleasing to my eye. The combination of tonality (technically, “dynamic range”), acutance, and granularity when viewed on an iPad or computer screen looks great. This is the visual embodiment of progressive obsoletism! By contrast, my black & white process uses techniques that are known to produce negatives that should last for hundreds or thousands of years without regular intervention. So, barring disaster, long after all the hard drives have been wiped clean, the DVDs have faded into uselessness, and the software used to decipher today’s data has become more arcane than odd-dialects of ancient Sumerian, my black & white negatives should still be identifiable and usable as photographs. Whether or not anyone cares in a hundred-plus years is another story. In my research for books and other photographic endeavors, I’ve often thought it ironic that 19th century glass plates will likely outlive virtually all the images being made today. I hope that I’m wrong. And, since I won’t be around in 100+ years, I’ll never know, but just in case I keep at black & white film photography, at least some of the time. And since I scan my negatives at high resolution, I’ll have most of the benefits of digital storage as well as that offered by traditional film. At least there’ll be some images of modern trains alongside the plates of Baldwin 2-8-0s. Having earlier this year made modifications to my process (for a future post), I then souped the film, scanned it, and analyzed my results. Pulling the film out of the tanks, I was immediately disappointed, but then, after scanning, I gradually came to accept and finally embraced my results. I’ve displayed a few here. Choice of subject matter was key to my choice of equipment and media. I largely photographed former Boston & Albany, Central Vermont, and Boston & Maine lines; the same railway lines I photographed as a kid—thus keeping with my theme of continuity. Earlier this year, I’d embarked on a similar project, photographing in Dublin, but using a different set of retro-equipment (another the topic for a future post). Not only do these images offer an element of consistency working with photos from my archive, but I feel they also work well as stand-alone photographs. I have plenty of color digital images to satisfy commercial illustration requirements and my personal needs for instant image analysis (did I catch it? Was the light right? Did that cloud get in my way? Are my exposures tight?). But, I also have these satisfying monochromes, that may, so it seems, last for a virtual eternity. Coming soon, I’ll post the details of my exposures, technique, and chemical process. Stay tuned! For the next post in this series see: Black & White revisited part 2, Secrets Revealed! Technique: Use a tripod and select a slow ISO; then after making a test shot, adjust exposure to ‘overexpose’ by about one stop, while using the self timer to actuate the shutter to avoid camera shake. On the left an ÖBB steel train led by Siemens Taurus electrics has paused at Schwarzach-St. Veit, Austria . This photo was exposed using a Panasonic Lumix LX-3; ISO 80, lens set at f2.2 with a timed exposure estimated at one second with the camera in ‘M’ (manual exposure) mode and fitted to a portable miniature Gitzo tripod. As described in Installment 3, the Lumix LX-3 is a compact lightweight digital rangefinder camera that features excellent optics (Leica Vario-Summicron f2.0-2.8/5.1-12.8 [mm] ASPH) and the ability to set functions manually. I’ve found this is a great tool for making urban night photos, and I’ve developed a successful technique well-suited to nocturnal railway images. 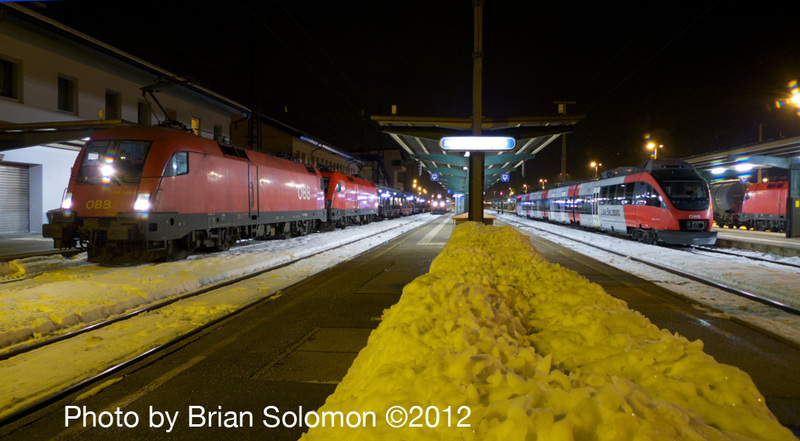 I made this image with my LX-3 on January 11, 2012, at Schwarzach-St. Veit, Austria, which features double-headed Siemens Taurus electrics on a steel train. When making night photos, the tricky part is obtaining a satisfactory exposure while keeping stray light away from the lens. For night photography, ‘faster’ isn’t necessarily better and the first thing I did was select the slowest ISO. The slowest ISO results in less noise, offers better exposure latitude (range of exposure captured from the highlights to shadows), while offering a sharper and more saturated image. Through experience, I’ve found that the LX-3 produced its highest image quality at ISO 80, and above ISO 200 its images tend to toward the unacceptably noisy (‘grainy’ or pixilated to the eye). Since my subject is static and the camera was secured on a tripod, there’s little advantage in selecting a Higher (faster) ISO. Its true that higher ISO allows for faster shutter speeds, but in this case the difference of a stop or two would be effectively irrelevant; since the light was so low, my exposures would be relatively long anyway. To calculate the appropriate exposure, I’ll make and analyze a test image. Here, my process may seem counterintuitive and it requires me to override the camera’s programming. In a nocturnal situation, where the sky is completely dark and there are a variety of hotspots caused by electric lamps (and in this case, acerbated by bright piles of snow), I’ve found that the LX-3’s automatic metering modes tend to seriously underexpose the image (in other words, it fails to allow sufficient light to reach the sensor). This is a result of the metering biased for daylight situations which has tendency weigh the effects of bright lamps too heavily and thus overly shorten the exposure time for a nocturnal setting. Strictly relying on either the camera meter or the basic automatic settings is an underexposed digital image. (Lumix offers some automated programmed settings to serve these situations, but I prefer to do this manually). Another problem is the camera display image. In extreme circumstances, such as night photography, the jpeg displayed on the camera screen is a ineffective tool for correctly gauging exposure. Not only is this jpeg compressed and optimized for computer-screen viewing, but on-camera it is presented much lighter than the data in the actual file and so doesn’t provide an accurate assessment of the scene. So, what looks great on the back of the camera may in fact be way too dark in the file. To overcome these difficulties, I make a test exposure with the camera, then carefully observe the histogram to make manual corrections that increase the exposure. In this nocturnal circumstance the majority of the histogram exposure graph may be too far to the left (indicating overall under exposure). Since I want to retain some highlight detail, I’ll make a second exposure, usually between ½ and a full stop over exposed (that is, I make the exposure lighter than that recommended by camera-meter, usually by increasing the amount of time the shutter is open, say from ¼ second to ½ second; or by using the exposure compensation feature, see below), and then gauge the histogram so that there’s a hint of highlight hitting the far right, but with the majority of the image-data filling the central portion of the graph (rather than too far to the left, as in the first exposure). In a rushed situation, I might skip the test exposure and histogram analysis, and just increase the exposure by 2/3ds to a full stop. This can also be accomplished by simply adding in ‘+2/3’ or ‘1’ on the exposure compensation menu at the left-hand side of the screen (with the LX-3: using the ‘Q-menu’ toggle, go left until the ‘+/-’ is highlighted yellow on the screen, then with the same toggle, move up two clicks for ‘+2/3’, or three clicks for ‘+1’). Then you can use the camera in either aperture priority mode (‘A’ on the top dial) or shutter priority mode (‘S’ on the top dial). This is a great compromise, if you don’t feel confident reading the histogram. If possible, make several exposures, perhaps increasing them in 1/3 stop increments. Examining the test exposures, I also watch carefully for flare caused by stray light hitting the front element of the lens. Flare greatly reduces shadow detail and may cause unpleasant or unnatural patterns in the image. While Hollywood productions in the 1970s ‘discovered’ the use of flare as a dramatic technique, and I occasionally use this myself for effect, generally speaking it is best avoided, especially in situations such as that at Schwarzach-St. Veit. If I cannot place the camera in a natural shadow (such as that presented by a mast, canopy, or other infrastructure), I’ll carefully shade the lens with my handheld notebook (or anything else that I have handy). It’s important to insure the notebook doesn’t crop the frame. One last point, to avoid shaking the camera, I set the self timer for 2 seconds, and then gently stand back and remain still while the camera exposes the frame. On March 30, 2012, a northward CSX auto rack train passes beneath the Bear Mountain Bridge near Fort Montgomery, New York, on its way up the Hudson River. This afternoon image was exposed with my electronic Lumix LX-3. This is the in-camera jpeg, made with the ‘vivid’ color profile with the camera set in the ‘S’ (shutter priority) mode using pattern metering. It was exposed at 1/640 of a second at f 5.0. Technique: Bring This Camera Everywhere! Over the years my philosophy has resulted in towing around various and different amounts of equipment. Constantly carrying a film-based SLR with a full set of lenses really was pretty awkward, not to mention the big bag of film! It’s one thing to have a camera, it’s another to try to anticipate every possible situation all the time. Beginning in 2001, my ‘everywhere camera’ was a Contax G2 range finder, which had its benefits, but was comparatively heavy, and while it came with interchangeable lenses, these tended to fill my pockets. In summer of 2009, my digital guru Eric Rosenthal lent me a Panasonic DMC LX-3; I was immediately convinced of its merits and bought one. Since then I’ve made great use of it, and I feel it is as near as perfect an ‘everywhere camera’ as I’ve ever owned. The LX-3 has a variety of kin, including the newer LX-5, as well as the almost identical Leica D-Lux3/4/5 models, with newer models recently introduced. I’ve only used the LX-3, and I’m not intending to compare my camera with the gamut of similar models or its competitors available to photographers today. Rather, I describe its pros and cons, and how this tool has benefited my photography. The LX-3 offers several key qualities that have allowed me to make numerous excellent photographs: it’s compact, versatile, flexible, fast, durable, and offers exceptionally high quality images for its relatively small size. I can bring it just about everywhere (within reason), and with it I have a dependable tool to make photos. Three of my principle objections to many small. ‘snapshot-style’ cameras are their low-quality optics, an inability to operate the camera manually, and an unavoidable delay from the time the shutter-button is pressed to the time the shutter opens. With the LX-3, not only I can get around all of these problems, but I get performance that rivals that of much larger camera systems. The LX-3 is equipped with a great lens — a Leica Vario-Summicron f2.0-2.8/5.1-12.8 [mm] ASPH, which is extremely sharp, fast, and offers a nice color palate. While the LX-3 has a variety of modes, it has manual capabilities that allow me to set shutter speed, aperture, ISO, and focus settings (although manual focusing is awkward). Furthermore, when automatic settings are used, these allow for a degree of manual override including the ability to change metering modes and make adjustments with exposure compensation. The degree of delay varies depending on how the camera is set; when the LX-3 is used as a fully automatic camera, or allowed to ‘sleep’ between exposures, there is an objectionable delay. However, when operated manually, setting focus and exposures using the toggle switch, and leaving it ‘queued up’ and ready to go, exposure can be made virtually instantaneously. I’ve used my LX-3 set at 1/2000th of a second to capture a German ICE-3 gliding along at more than 160 mph—no easy feat even with an SLR. If you ever want that ‘deer in the headlights’ feeling, try photographing a truly high-speed train full frame with a standard lens (and no 10 frames-per-second motor drive!). I’ve found several failings with the LX-3. It lacks a built-in view finder. While there is a separate viewfinder attachment, I’ve shied away from this for two reasons: it’s relatively expensive, and I’ll surely lose it. So while in most situations the window at the back of the camera works reasonably well, it suffers in bright daylight, and I don’t like to stand around with the camera at arms length trying to compose an image. While other models have longer zooms, the LX-3’s range is limited to a view roughly equivalent to 28-65mm on a traditional 35mm film camera. This ranges suits about 85 percent of my requirements, while having the side effect of taking away the ‘telephoto crutch’, which forces me to work with more conventional focal lengths. The battery life on the LX-3 is poor, so as a result I carry three or four batteries with me, especially in cold weather. On a busy day, I can easily tap through three batteries. Another flaw is slow cycle time, which is partly a function of how I’ve set up the camera. I expose both a RAW and large JPG file simultaneously. While jpegs suit most of my requirements, I’m not just taking photos for today, and I’m uncomfortable with long-term storage problems and compression qualities inherent to JPG format. Furthermore, RAW files offer considerably more data, and this can be valuable both for publication and situations where post processing manipulations are necessary (both topics for another day). But, I’ve made prints from in-camera jpegs up to 13×19 inches that are fantastically sharp and colorful (including the photo displayed here). And I’ve used LX-3 jpegs in books and magazines. The LX-3 also offers a variety of in-camera color profiles with various color palates and saturation levels; while these are strictly applied to the jpegs, they allow for added creativity when composing images. It has an excellent image stabilizer, which allows for very slow shutter speeds hand-held, and can be switched off when necessary. Another distinctive tool is the ability to control the aspect ratio (external dimensions) in camera; its four standard ratios range from a square to 16:9. In addition, there are myriad controls that enable a high-degree of customization for both user convenience and file output. Control, flexibility, and high quality are the prized qualities that sold me on the camera. The LX-3 may appear as a snapshot camera to the unknowing observer but it offers most of the control and quality that I’d expect from a high-end SLR. My intended purpose for LX-3 was as a ‘everywhere camera’ to be carried when I wasn’t carrying my full camera kit, but it soon developed into my staple tool for railway photography, as well as urban adventures and other projects. Later installments of Tracking the Light will highlight images made with the LX-3, to demonstrate its abilities as a high quality image making machine.